Now that you’ve completed the Discover phase, you’re ready to develop your Lightning Experience rollout plan. 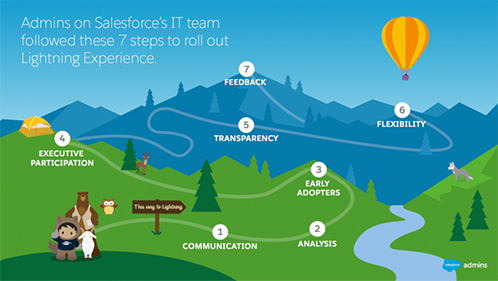 Curious how Salesforce rolled out Lightning Experience? Check out this ebook. We recommend rolling out Lightning Experience in phases, starting with a small pilot program. Begin with select users in a sandbox environment or in your production org, using profiles and permission sets. By starting small, you can test new business processes, features and functionality, and training materials in preparation for launching Lightning Experience for everyone. Check out Craft & Execute Your Rollout Strategy in the Make the Move to Lightning Experience trail.